I got turned on to two treasures from Miuccia Prada at the end of the summer. ‘WHAT are THOSE?’, my brain screamed. But Ms Prada provides. The shoes were from this season – Fall Winter 2012/2013. The fashion gods had smiled down upon me! They knew, innately knew, that I NEEDED those shoes this season. 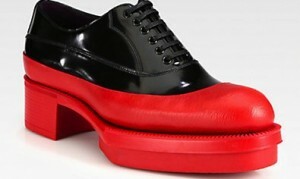 That I’d wear the wacky rubber-dipped platform oxfords with both jeans and cocktail dresses alike! That they’d become my go-to, day to night, wear-them-every-day-possible shoe. And that they embodied the exact kind of grown up wildness I was after. So Grazie, Miuccia. You nailed it on both fronts.